There are so many Australian national parks, and the Australian national parks section of this guide has grown so big, I had to turn this page into a small site map. Below are links to all the information about Australia's national parks that's available on this site. Here is a summary page: National Parks In Australia. It has a short intro and description for every national park. The biggest of the Australian national parks, three hours south-east of Darwin, is well known by name. But no matter how many photos you have looked at, and how many times you have watched Crocodile Dundee, you ain't seen nothing yet. It would be a shame to race through Kakadu National Park on a one day trip, and it would be a shame for me to race through on only one page. I have devoted a whole section to this magnificent park, and still I feel it deserves more. I will be visiting Kakadu again and again, and I will be adding more information here. Visit Kakadu National Park: how to get there and how to get around. When Is The Best Time To Visit Kakadu National Park: advantages and disadvantages of dry season and wet season travel. What To See And Do In Kakadu National Park: the attractions, lookouts and walks in Kakadu National Park. 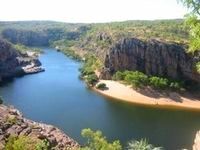 Accommodation And Camping In Kakadu National Park: accommodation listings and information for camping in Kakadu. Gunlom Falls: one of my very favourite locations within Kakadu National Park. Avoid The Crowds In Kakadu Park: how to get away from the other tourists in this popular national park. Kakadu Webcam: live streaming video and audio of the wildlife at the Mamukala wetlands. 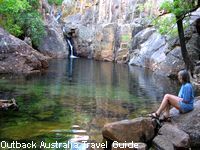 Litchfield National Park Attractions: The most popular waterfalls and plunge pools. The very best camp site in Litchfield National Park and other little known places in this increasingly crowded national park. This is my favourite Australian national park and in this section you can find out why. 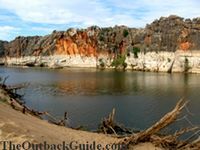 Nitmiluk National Park: Nitmiluk is the Aboriginal name for Katherine Gorge National Park. This page has all the visitor information. Canoeing Katherine Gorge is the best way to see it. Katherine Gorge Cruises are the most convenient way to have a look. Katherine Gorge, Northern Territory: The Climate. Australia's north experiences dramatic changes during the wet season. This page is about the best time to visit Katherine Gorge and for the above activities. This rugged Australian national park is little known by tourists but popular with locals. Small park, big scenery. This Australian national park is located on the border of the Northern Territory and the Western Australia Kimberley. Ayers Rock is of course the most famous of all Australian national parks. The popularity brings commercialism and huge numbers of people, and both can spoil the experience. The articles in this section try to help you avoid that. Ayers Rock Facts: geological, historical and other quick facts about the impressive monolith. Size, exact location etc. Ayers Rock Budget Tips: how to cut costs during your Ayers Rock visit. Ayers Rock Sunset: A colourful spectacle that many people want to see. Too many? Climbing Ayers Rock: It's allowed, but is it worth it? The Olgas/Kata Tjuta: Make time for them! Previously receiving little attention, this park has been made famous by the Wolf Creek murder movie. Right now Wolfe Creek National Park is the most famous Western Australian national park. Wolf Creek, The True Story: tells you what really happened on that fateful night in the Australian Outback. 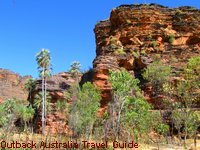 All the following links will take you to my other site, the Kimberley Travel Guide, where the West Australian national parks are covered in detail. The links will open in a new window. (Hold down your CTRL key and click if your pop up blocker prevents them from opening.) Once you have finished browsing the Kimberley Travel Guide just close that window to return to this page. Also known as Purnululu National Park, this world heritage listed Australian national park is one of the main tourist magnets in the Western Australian Kimberley. This popular Western Australian national park offers only one walk, which follows the river in between the towering gorge walls. Only a few kilometres outside the small town Fitzroy Crossing this national park is known for the colourful cliffs of the gorge. It's the only bigger national park in Australia's Kimberley that you can access via an all sealed road. 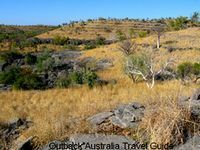 Return from Australian National Parks to the Outback Australia Travel Guide home page.